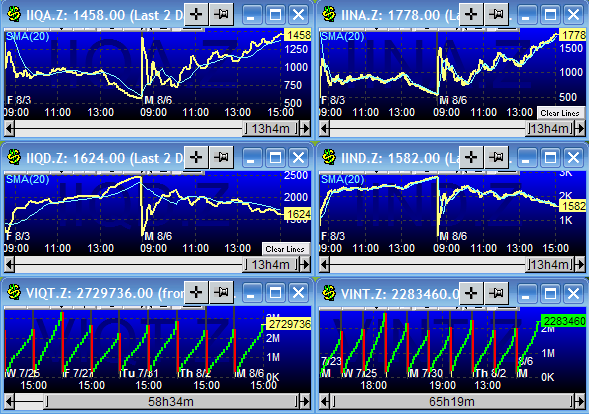 The image below is a snapshot of the market internals for Monday,August 6, 2007. As you can see the NASDAQ decliners outnumbered the NASDAQ advancers while the NYA advancers versus decliners were slightly positive. It was a heavy volume reversal day with shorts getting squeezed in the financial stocks and in large caps. Please note that the NASDAQ numbers are on the left and NYA are on the right, with IIQA and IIQD being the NASDAQ advancers and decliners, respectively. Today’s action shows how very important it is to have stops in place if you get caught on the wrong side of the market, and also how dangerous the leveraged ETFs can be if you are not nimble. This entry was posted on Monday, August 6th, 2007 at 2:00 pm	and is filed under Market Analysis. You can follow any responses to this entry through the RSS 2.0 feed. Both comments and pings are currently closed.